Home »Posts Tagged "Content Design"
To output a decent infographic that stands out and speaks to the audience a marketer targets, is a complex work that usually requires collaboration of various experts. 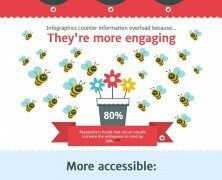 This graphic walks you through the 7 basic steps of infographic production. Talk is Cheap! Visual is gold and what captures internet users’ attention nowadays. Have a look at how you can strategize compelling content marketing campaigns that will boost online performance.